Nature tourism never disappoints tourists, as it becomes a good location to enjoy the nature and find peace. In Rante Angin District, there is a recommended vacation destination called Blue Lake and it is situated in Walasio Village. The location is near to Tamborasi, having the distance of 12 km. The lake has a unique characteristic, which is located near to a mountain. That means visitors can feel a peaceful and refreshing atmosphere there. Thanks to the unspoiled nature, everyone can relax and enjoy fresh air in that location. As the name suggests, the water of the lake has the color of blue and it is quite clear. Here is the thing. No visitors are able to refuse the temptation in swimming in the water, as the water is fresh and beautiful. Next, you can see shady trees and rocks, surrounding the lake. All these features make a perfect atmosphere for either swimming or playing in the water. Not to mention there is a small beach with its white sand located near to the lake, which emits a clean and comfortable aura. The best part of North Kolaka Regency is the nature, as many beautiful tourist spots are available there. 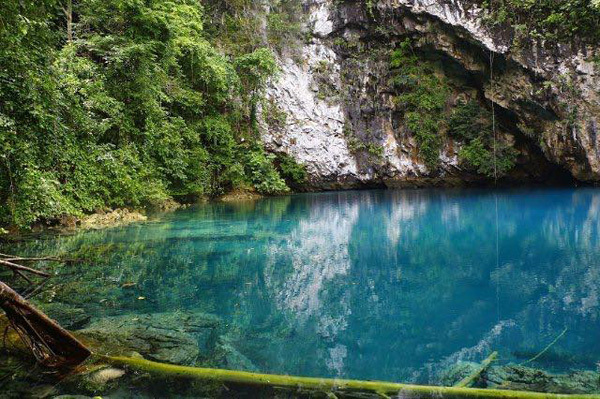 If you look for a serene tourist spot with its beauty, there is Blue Lake. It is considered a good location for relaxation and the name is similar to other lakes located in South Kalimantan and Bengkulu. Still, it emits a distinct nuance and you should never deny its beauty. A unique part of the lake is the taste of the water, which is brackish. It is because the location is near to the beach (about 12 meters). Tourists should be grateful to Blue Lake, as it is located near to the beach. That means visitors can enjoy two different tourist locations at once and they can relax wholeheartedly there. The diameter of the lake is about 164 meters and tourists can do many things, including snorkeling and swimming. As an alternative, you can simply walk around and feel the serene nuance of the lake. The crystal clear water lake is somewhat mesmerizing and soothing, which are good for relaxation. Another interesting activity to do in Blue Lake is photography, as all parts of the lake are beautiful and worth some pictures. Some parts of the lake even feature hidden spots, so you need to give some efforts to explore them all. As for the tips, you need to carry a camera, snacks, and bottled water. Not to mention visitors must wear proper footwear, as the landscape is a little bit slippery, especially during rainy season. For those who come from Jakarta or other provinces, the first destination is Kendari City. A flight to Haluoleo Airport won’t take much time if you use the right plane, after all. Once you reach the capital of Southeast Sulawesi Province, it is time to reach Rante Angin District through Poros Ranteangin-Kolaka Street. The trip takes about 6 hours, as the distance is 266 km. Later, you need to reach Walasio Village and directly head to the lake. That’s all.